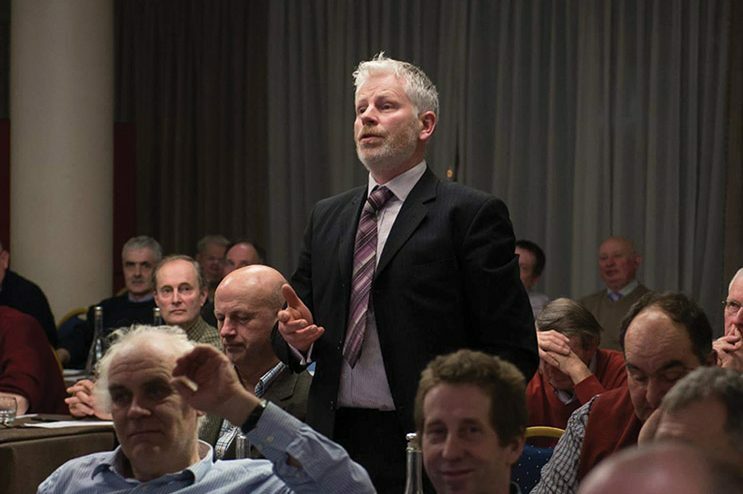 John Brooks is in his fourth year as ICSA (Irish Cattle and Sheep Farmers’ Association) national sheep chairman. Farming in Taughmaconnell, Co. Roscommon, he previously held the position of sheep vice-chairman and is a long-standing member of the association. John was elected chairman in 2015 and is now in the final year of his second term. His stock comprises pedigree Suffolk and Texel flocks, along with a mid-season commercial flock and a mix of cattle systems, including suckler, dairy calf to beef and store to beef. He is assisted in the running of the 250-acre family farm by his wife Bernadette, children Isabel and Michael (who are 11-year-old twins), Rachel (10) and Jack (nine), and his mother Ellen. “We lamb over 600 ewes a year,” he explains. “The lambs are brought to finish for the French and European markets with typical dead weight between 20kg and 23.5kg. We’re also involved in pedigree breeding which we treat as more of a hobby than a money-making exercise. I’ve made a lot of friendships and built up a network of contacts in the sheep sector through pedigree breeding. Roscommon is synonymous with sheep farming which means John’s farm – which is located halfway between Athlone and Ballinasloe – is close to a number of sheep marts and lamb processing facilities. “South Roscommon is real sheep country,” he proudly states. The ICSA was founded in 1993 by farmers who were concerned that there was not an adequate voice for the beef and lamb sectors. At first, these farmers felt that the old ICSA (Irish Cattle Traders and Stockowners’ Association) could be revived. This association had its roots in the 19th century and several references to it appear in James Joyce’s famous work, Ulysses. Following a series of meetings in traditional beef fattening areas, it was decided to relaunch the association. However, while the link with the old ICSA was retained in the name, this was very much a new start-up association that pledged to fight for all drystock farmers, including sheep and suckler farmers. Pat Lalor, who is the man behind Kilbeggan Organic Porridge Oats, was the association’s first secretary. His vision was to put in place the structures for a professional organisation and this was reflected in the recruitment of a full-time general secretary, Eddie Collins-Hughes, and dedicated recruitment officers. Jimmy Cosgrave from Meath was the first chairman. He was succeeded by Albert Thompson from Laois in 1996. Within a number of years, ICSA had established a full-time office in Portlaoise and the association was put on a very strong footing by Eddie Collins-Hughes on an extremely tight budget. However, he stepped down as general secretary to pursue a role in the Carers’ Association in 1998 and was succeeded by Ray Doyle, who was replaced in turn by Eddie Punch. Eddie became general secretary in 1999 and since then, the ICSA membership has grown to over 10,000 members, while its progress has been recognised in being appointed social partners by the Government. The ICSA national executive – which John Brooks has sat on for the past nine years – has over 100 members drawn from the 26 counties on the basis of four members for each county (subject to membership criteria). “Our members are driven by a passion for what they do rather than by financial gain. We’re all voluntary with the association being funded entirely by membership,” he points out. The ICSA is committed to representing the interests of Irish sheep farmers in the strongest possible way at home and abroad. For many years, the national flock was in decline, but this has recently levelled off. ICSA now wants to make sure the sector is stabilised and made attractive to young, energetic farmers. ICSA believes that Ireland needs to be careful that any increase in sheep production is in response to an increased demand on UK and European markets. The association also wants to see an end to the severe upper weight limits being imposed by the meat factories, which seriously erode sheep farmers’ profits. The farm organisation is also seeking a Government commitment for better and more targeted funding for the sheep sector under the Rural Development Programme. It is also keen to ensure that the new EID regulations do not impose any extra costs or bureaucratic burden on Irish sheep farmers and is particularly adamant that there is no justification for electronic tagging on lambs going direct to slaughter. ICSA is also committed to removing all remaining blockages on live sheep exports. “In my view, it’s all about family farm profitability. Family drystock farms must become profitable again and our aim should be to at least achieve parity with the average industrial wage,” says John. The sheep chairman, whose vice-chairman is Sean McNamara, feels it’s unacceptable that sheep farmers should bear all of the annual cost of €2.5 million for mandatory EID tagging. ICSA recently held a protest on Kildare Street in Dublin after Minister for Agriculture Michael Creed announced that sheep sold from October 1 2018 will have to be identified electronically, and a one-off support measure up to €50 per keeper will be made on the first purchase of EID tags. “It has been done without warning or consultation at the behest of processors who are the only ones who will benefit. It is unacceptable that sheep farmers should bear the cost and reduces our profit margin by 7%,” he adds. ICSA also used the protest to raise concerns with the clean lamb policy for stock presented at meat factories. Some processors have refused to accept sheep and lambs they consider dirty and John accepts that winter shearing of all hoggets destined for slaughter may need to be introduced. “We are demanding an immediate review of the implementation of this policy,” he says. The affable Roscommon man notes how there is also a growing sense of frustration at the dismal return sheep farmers are getting for their wool. “The situation at the moment is that wool is worthless and it will become a welfare issue on farms in the near future. “The emergence of synthetic materials saw wool go out of fashion 50 years ago. In the intervening years, it has been dumped into China and now we are suffering the vagaries of the Chinese market for wool. John, who will continue to work for the betterment of sheep farmers, describes the Government and EU Commissioner Phil Hogan as “good listeners”.